Stress Physiology in Cotton, edited by University of Arkansas professor Derrick Oosterhuis, takes an in-depth look at one of the world’s most important crops. In order to keep cotton sustainable and profitable, how it reacts to stresses, diseases and changes in environmental conditions must be understood. Oosterhuis called on experts from around the world to explain how the plant reacts in different conditions. The book opens with a discussion of the effects of high temperature on the crop. Temperature, which is one of the most important ecological factors that determines the growth and productivity of cotton, is key to understanding the crop. “Increased temperatures from global climate change are projected to cause substantial losses in crop productivity by the end of the twenty-first century,” Oosterhuis said. In addition to the issue of temperature, the book addresses how humidity, water deficiency and different lighting conditions affect cotton. The final chapters examine various stresses and diseases in the plant from the root system to geminiviral diseases as well as abiotic stress and cotton fiber development. 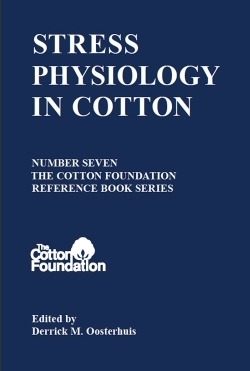 Stress Physiology in Cotton is published by The Cotton Foundation and is part of The Cotton Foundation Reference Book Series.